Appliances, lighting, and faucets, oh my! The most fun part of any reno, well to me anyways, is the finishing touches. Early on in the renovation planning stage, I sourced and decided on the appliances, lighting fixtures, faucet and sink so that they could be ordered and already be delivered when they were needed. I didn’t want any problems with waiting for items to be in stock or shipped. For appliances, I had a wish list, an induction cooktop, downdraft fan, a microwave/convention oven, wall oven, a warming drawer (since we entertain a lot at the cottage and in the winter, it’s always nice to have warmed plates), a wine fridge and a new dishwasher (which quickly became a panelled dishwasher). I decided on Bosch, for everything but the wine fridge, because their appliances hit every mark and I love their sleek look. Early on, I had seen this Brizo Artesso faucet and I had to have it. The cool industrial yet rustic vibe was perfect for my vision of the kitchen. Brizo agreed and I’m the happy recipient of it, in a beautiful oil rubbed bronze finish. For the sink, I was very torn between a large single, double or a sink and a half. I went back and forth relentlessly. 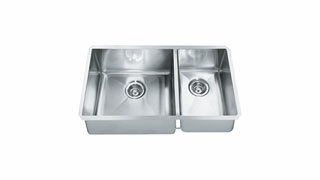 A large single sink is great, lots of room to do those large pans and soak just about anything, but I really wanted a place to stash my dirty or drying dishes (I hate on-counter drying racks, which I’ve had and continue to have, and I resent it a little every day). A double sink would give me that extra space to hide dishes but each sink was a little on the small size, given that I had to stay within a 31″ total width, so I compromised with a sink and a half. I settled on a Franke sink as it gave me the contemporary edge that I wanted, had the size I needed and had slightly rounded corners to make clean up a breeze. Onto my lighting choices – I’ve had a hate on for the existing white track lighting, as there is typically only one or two of the lights working at any one time and let’s face it they are just fugly. We added the Pottery Barn pendants when we first bought the cottage and they have certainly helped but I desperately need more light than they can give. (see before pics here). An open rectangular lantern fixture with plenty of lights would be the perfect fit for the long island. I also wanted one without glass, to keep glass cleaning down. 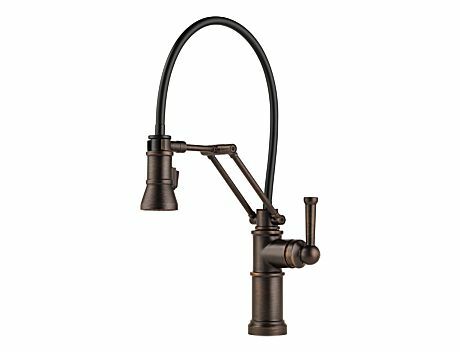 The Hinkley Fulton open lantern is perfect with it’s black iron exterior frame and it’s soft bronze interior finish which ties in with the oil rubbed bronze faucet. To mount this, we will have to have the electrical boxes (where the track lights are now) capped and then somehow hidden (I’ve given this job to our fabulous carpenter and electrician). 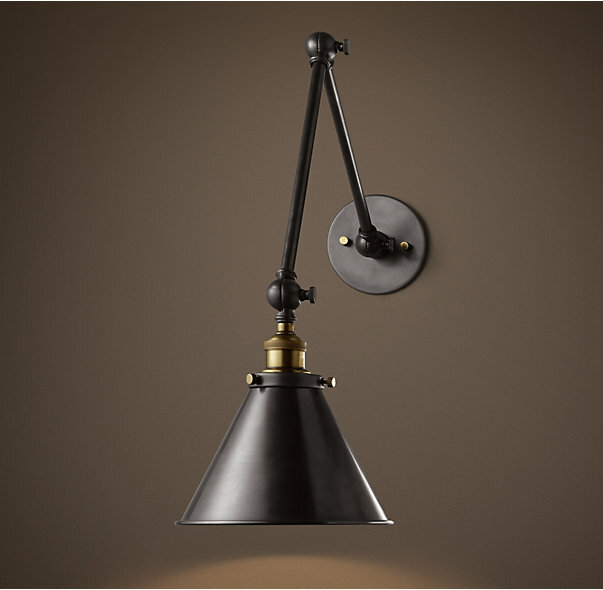 To coordinate with it, Restoration Hardware’s 20th Century Library sconces with their iron finish and touch of brass (to pick up on the warm bronze tones) were an easy choice. Three of them will line up on the far wall between the windows to light the counters and open shelves there. I also had my heart set on a pendant light over the sink and wanted something that was light and bright but with some dark metal. 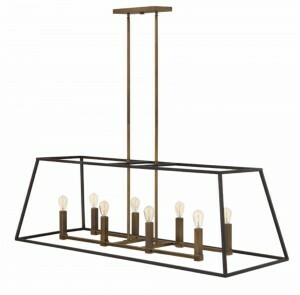 Hinkley hit it again with this Clancy fixture, in a warm bronze finish. Again, some creative carpentry will have to be done to hide the wiring…oh the joys of a log home. **Disclaimer, Brizo provided me with the faucet of my choice, in exchange for my honest opinion of it, here on my blog.